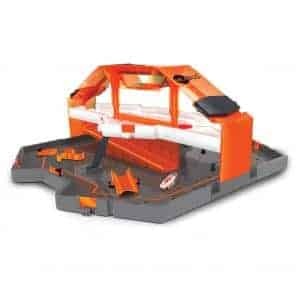 The Hive Habitat set is a multi-level playing area that has an interactive platform and built-in ramp allowing the HEXBUG® Nanos to move about both areas. There are even working doors and the kids can connect their own set of 35 construction pieces to create their own Nano maze. I particularly like that this interactive activity set has a lot of play areas but does not take up a lot of space and folds up for easy storage and even includes a carrying handle for on-the-go fun. Designed for ages 3 and up, the HEXBUG® Nano Hive Habitat Set is a lot of fun and my children are having a blast playing with it. This play set is very sturdy and I was quite surprised how well this tech toy stands up to my active little ones. Even more impressive is how engaged my children are when playing with this toy….they just love it and have a blast watching their Nano critters moving around the multi-areas. While out shopping on Black Friday, I discovered great deals on other HEXBUG® sets that can connect to the Hive Habitat expanding the Nano world for additional fun. You can purchase the HEXBUG® Nano Hive Habitat Set online at retailers nationwide. You are invited to visit the HEXBUG® website to view the entire collection of toys and accessories available.